Homewares aren't what I first think of when I think ASOS as they're much better known for their celeb-inspired clothes, but the online-only store currently carries a lovely range of flocked home accessories. Being from ASOS, they're also pretty inexpensive, so a great way to try out the current enthusiasm for all things flocked without breaking your budget. The set of four coasters is just £5, the candlestick and cushion are both £10 each and the photo frame is £12. 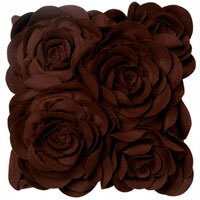 This 'Tessica' floral cushion in chocolate brown is a great example of the trend for 'statement' cushions this season. It's 40 x 40 cms, the cover's a high-percentage wool mix and the 3D roses are felt, so soft enough to lie back on comfortably. It's £30 and also comes in red and a soft aqua blue. How gorgeously kitsch is this cushion? 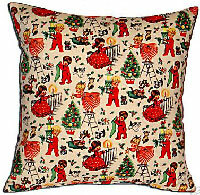 It depicts little boys and girls decorating a Christmas tree and is really very sweet. Made from a 1950s inspired vintage-style cotton fabric it comes with a 40 x 40cm cushion pad included and the start price is £9.50. Be quick, the auction only has one more day to run. The Cotswold Company has just launched its latest venture, online chair 'superstore' Chairs & Wares. The store aims to offer chairs at around 25% less than you'd find elsewhere and stocks a wide range of popular designs and has a made-to-order line as well. I've been eyeing up the lovely fat floor cushions which come in a range of fabrics including leather, faux suede, corduroy and, Autumn favourite, tweed. They bring to mind that favourite fantasy during cold weather: laying around in front of a roaring fire on piles of cushions. They're priced at £55 or £70 for leather and come with free delivery as a launch promotion. Marks & Spencer are currently offering 3 for 2 on most of their cushions, so take advantage to update the look of your sofa. Many on offer are a bit blah, though my pick would be the multi-stripe corduroy (I am a bit of a stripe freak). What is it about cut price stores these days? First it was Primark leading the fashion charge, and now Matalan's following suit with some lovely homewares. I love these tub chair and footstool sets - especially the red gingham. For only £99, they'd be great as a corner chair for the bedroom. I can just see my cute 50s style summer dresses draped over it, well, I could if the weather would get its act together! Also check out the new co-ordinating cushion range including a cute teal with chinoiserie print for £10, and rose print and textured rhubarb-coloured cushions for £8 each.